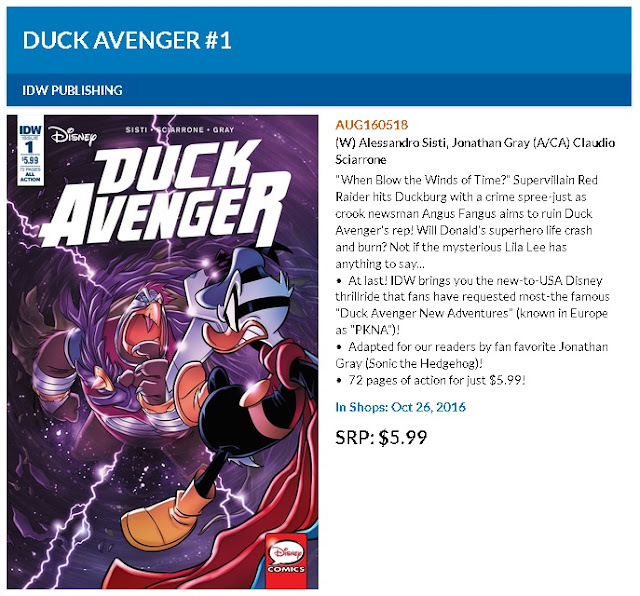 Duck Avenger #0 hit the comic shelves last week. I know some fans have been waiting a long time for this, but are there enough old fans to keep the series going? That was my first thought when I heard the news... I guess the majority of American readers picking up this comic don’t know much about what they’ll get – but I hope enough people get this bargain of a comic anyways and get hooked, making the series last. Because for $4.99 you’ll get a lot of comics for your money in this premiere issue! The new series from IDW starts collecting the Italian PK series, or more specifically the PKNA (Paperinik New Adventures) series. 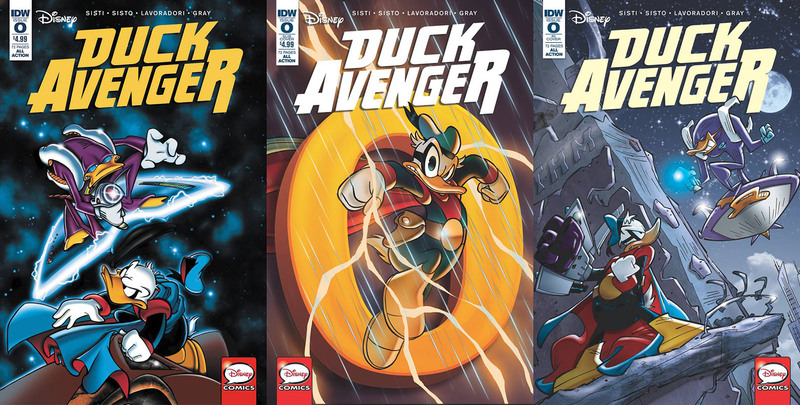 As the American title is simply Duck Avenger we could possible see the continuation PK² and the stories under the unofficial title Paperinik New Era (Gli argini del tempo and Il raggio nero) being collected in the same title too. But that is too far in the future to hope for yet. We also got a related series PK Pikappa, but unlike the ones mentioned above that one is a reboot with its own continuity. PK Pikappa already is partly published digitally in English as Superduck, and works better under another title I think. Even if the title name is just Duck Avenger, the series is actually referred to as "Duck Avenger New Adventures" in the bullet points in the August Previews catalog. So, what should people expect from the new Duck Avenger series? First, a lot of action! 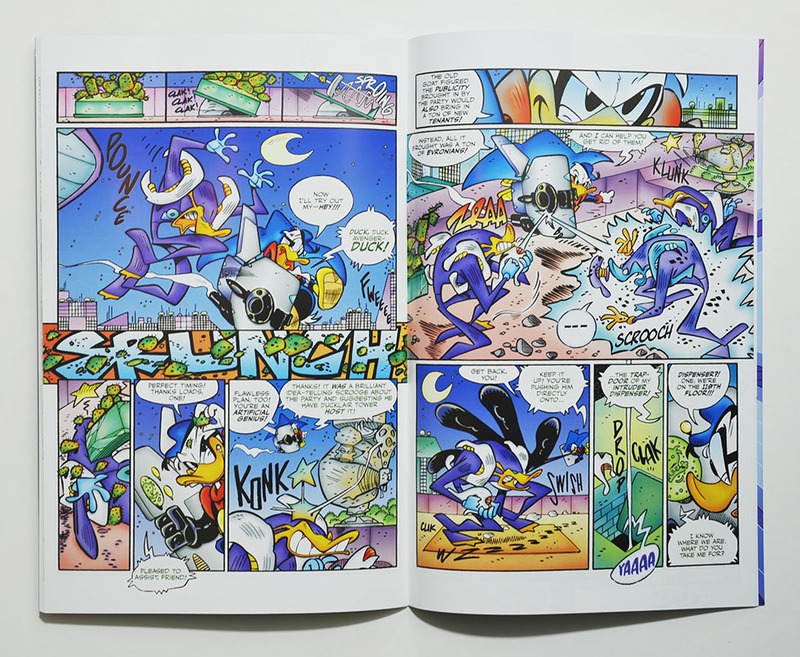 Both the storytelling, art and page layout will differ from what we are used to in a regular Duck story. It might look a bit strange at first, but you’ll get used to it fast. We’ll see Uncle Scrooge once in a while and Huey, Dewey and Louie in a couple of the first stories – but they seem to be busy with Junior Woodchuck camps. 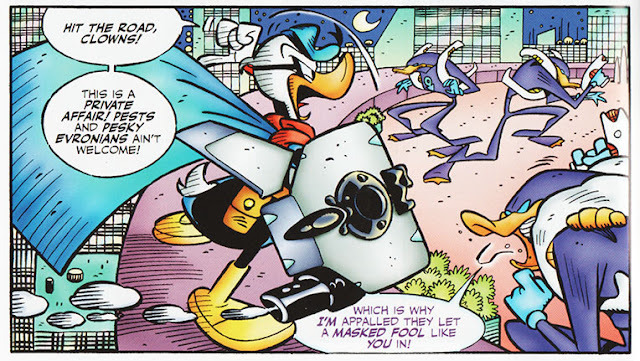 For the most part Donald/Duck Avenger has new allies and is fighting new villains in this series, and you won't see any of the "classic" characters. The stories are partly crime-fighting superhero stories – but with gadgets (like Batman) and not superpowers. But the series is also a sci-fi saga. Most of the stories are from 60-70 pages long, but we also have shorter side-stories I hope will be included by IDW. The first issue was translated by Jonathan Gray, and from what I’ve understood he will continue doing the rest too. And if you follow his twitter, he seems to be really excited about being able to do this – being a huge fan of the series. In fact I don’t think we would have seen this series in English at all if not for him! For more information read this interesting interview at Diskingdom. 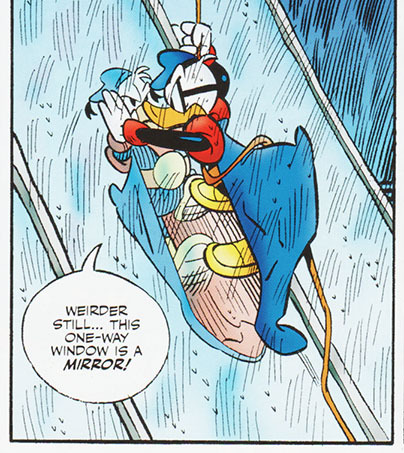 IDW often order new coloring for European stories in their Disney comics. But the coloring in Duck Avenger #0 is the original Italian coloring from 1996, with some minor adjustments like Scrooge’s spats. Even if the coloring is 20 years old and from the early days of digital coloring, I don’t think it appears dated at all. Currently a new issue is scheduled for release every second month (alternating with Walt Disney’s Comics & Stories). If IDW keep that schedule it will take eight and a half year to publish all 52 PKNA issues. That’s a long time, but I hope sales will allow that to happen! I’ve read most stories before, but I look forward to reading them again in English.